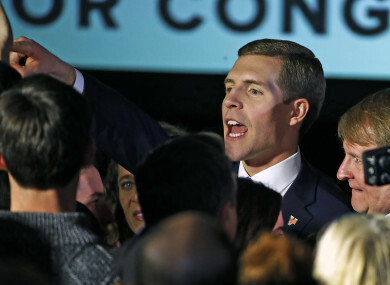 Conor Lamb, the Democratic candidate for the 13 March special election in Pennsylvania's 18th Congressional District, center, celebrates with his supporters at his election night party. US REPUBLICANS WERE eyeing up a recount and a lawsuit over perceived irregularities in a closely watched US House race in Pennsylvania. The four counties in the Pittsburgh-area district reported they had about 375 uncounted provisional, military and overseas ballots. They have seven days to count the provisional ballots, and the deadline to receive military and overseas ballots is next Tuesday. The GOP is considering requesting that election officials impound all ballots and machines in preparation for a recount request, according to a person familiar with the deliberations. This person spoke on condition of anonymity to discuss internal planning. Officials in Allegheny County, the most populous and Democratic-leaning county in the district, pushed back on Republican claims today, saying the lawyers had lacked written authorisation from the GOP and they had received no reports yesterday of malfunctioning voting machines. Lamb has declared victory. Saccone, a 60-year-old Air Force veteran turned state lawmaker and college instructor, isn’t conceding. Both men stayed out of sight today. Lamb, a Marine veteran, told supporters last night that voters had directed him to “do your job” in Washington. It’s not over yet, we’re going to fight all the way, all the way to the end, we’ll never give up. After the absentee vote count wrapped up yesterday, Saccone gained 14 votes, trimming Lamb’s lead just a bit in a district that Trump won by about 20 percentage points in 2016. Even before a winner was declared, Saccone was making plans to seek the nomination in a different district later this year. A state court has thrown out the state’s congressional map in a gerrymandering case. The current districts have been redrawn and the new ones will be in play in November. Pennsylvania’s congressional primaries are 15 May, and Saccone’s campaign officials say Saccone was now gathering nominating signatures in that new district. Lamb is expected to run in a new district west of Pittsburgh against Republican Rep. Keith Rothfus. That district was narrowly carried by Trump in 2016. It is far less friendly to Republicans than Rothfus’ existing district and is described by Republicans as a toss-up. Trump and his allies invested tremendous time and resources in keeping the seat in play yesterday in Republican hands, mindful the contest could be used to measure Trump’s lasting appeal among white, working-class voters and Democrats’ anti-Trump fervor. The White House scrambled to rally voters behind Saccone, who cast himself as the president’s “wingman”. But he struggled at times to connect with the blue-collar coalition that fueled Trump’s victory little more than a year ago. Trump campaigned for Saccone last weekend, urging voters not to “be conned by this guy Lamb”. But he also offered a full embrace of organised labour in a district with influential labour unions and a long history of steel-making and coal-mining. He also hammered Republican tax cuts as a giveaway to the rich and promised to defend Social Security, Medicare and pensions. Email “Democrat Conor Lamb claims victory in key congress election battle in Trump stronghold”. Feedback on “Democrat Conor Lamb claims victory in key congress election battle in Trump stronghold”.